Nanochemistry: Dr. Thomas Fischer won the Global Young Investigator Award! Dr. Thomas Fischer won the Global Young Investigator Award! 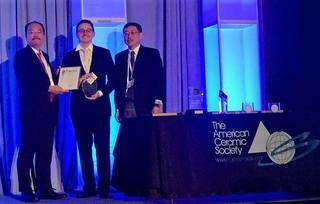 Dr. Thomas Fischer, subgroup leader in the Mathur Group, was awarded with the Global Young Investigator Award by the American Ceramics Society. The whole research group Mathur congratulates him on this great success!